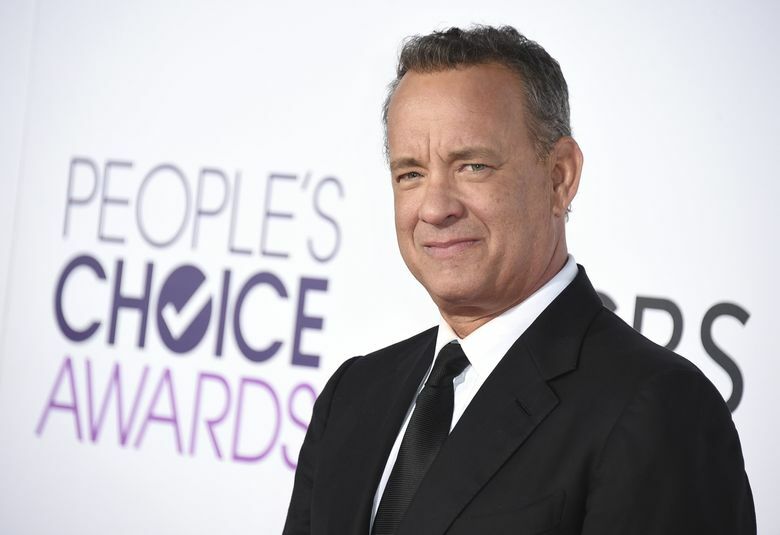 Tom Hanks will bring his new book, “Uncommon Type: Stories,” to McCaw Hall on Dec. 6. It should be no surprise that when it comes to interviews, Tom Hanks prefers to type. His new book, “Uncommon Type: Stories,” which will bring him to McCaw Hall on Dec. 6, is a collection of stories in which a typewriter makes a cameo in every one. (Additional tickets on the Patron and General level just opened up. Prices range from $60 to $175, include a copy of the book. and can be purchased at lectures.org, or by calling the Seattle Arts & Lectures Box Office at 206-621-2230, ext. 10). Hanks, who owns more than 100 typewriters, will portray career typist Ben Bradlee, the late, great editor of The Washington Post in the upcoming film “The Post,” co-starring with Meryl Streep. Hanks preferred that we ask a few questions via email. He wrote right back, talking a little about his collection of stories, his collection of typewriters and his gifting of a brand-new coffee maker to The White House press corps. And, we asked what Hanks thinks of when he thinks of Seattle, where he filmed one of his most-loved movies. Apparently, being “Sleepless in Seattle” meant some halcyon days on the water and, ironically, Hanks sleeping very well at night. When did you start writing the stories of “Uncommon Type,” and when did you write? I worked over the course of the years since November of 2014. My schedule is not set, but the mornings were times I wrote. But when I was shooting a movie, I wrote anytime and everywhere. Where did the stories come from? Wondering if you dash off ideas or notes in a book as you pass through the world. Do you sketch them out completely or just start writing? I started most stories with each title, seeing the characters and a theme to explore. Or, just a single moment in each story that became part of the whole chain. There’s a story in the book called “Christmas Eve 1953,” about a family’s traditions on that night, including an annual phone call between the protagonist, Virgil, and one of his Army buddies. What is Christmas Eve like for you? Christmas Eve has always shifted. With kids in the house, there is the visit of Santa leaving one unwrapped gift for the morning. We’ve always altered the routine. You have more than 100 typewriters. Do you have a favorite? And what’s it have that the others don’t? My favorite is always changing. Any Smith-Corona Sterling or Silent is a gem. Any Hermes, either the green or tan, all work like lightning. I have a thing for my Olivetti Lettera 22’s, as they are masterpieces of design, the action is crazy fast and light, and the typewriter is in the Museum of Modern Art. You put a coffee machine in the pressroom at The White House, so it’s clear you have a place in your heart for a free press. And you are portraying the great Washington Post Editor Ben Bradlee in “The Post,” about the decision to print the Pentagon Papers. Where do you get your news and why a coffee maker? I read the NY Times and listen to NPR all day. When I can, I catch “The 11th Hour with Brian Williams” on MSNBC to get the perspective on the crazy day. 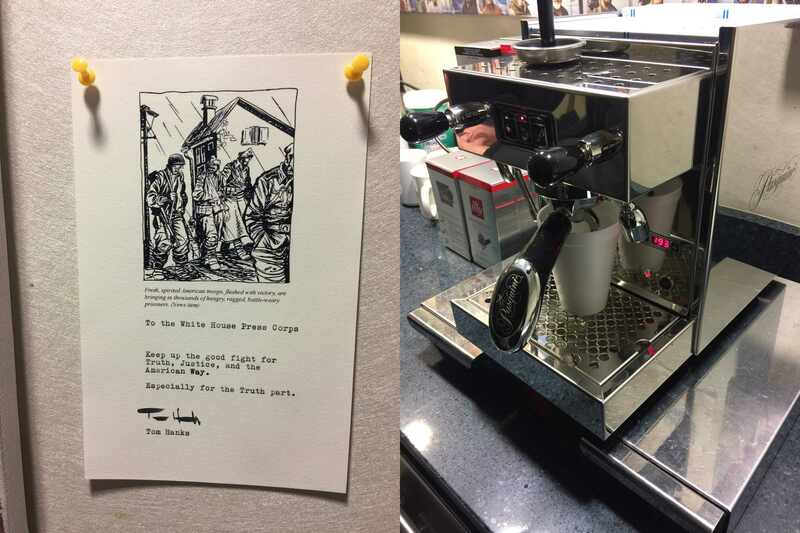 I put an espresso machine into the pressroom of the White House because they had the saddest little coffee machine I’d ever seen. What do you think of when you think of Seattle? Is there a place or a specific memory that comes to mind? My kids all learned to water ski off Mercer Island when the summer sun stayed out until 10:30 at night. Me driving the boat, them standing up, all of us out on the water until dusk and bedtime simultaneously. Glorious.